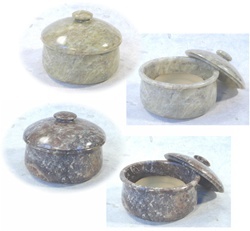 Gennuine soap stone bowls with lid. These heavy weight bowls are custom made for Em's Place, Inc. and come in shades of light and dark. The picture shows the basic colors and pattern styles. However, every item is a unique one-of-a-kind and therefore will not be exactly like the ones shown. 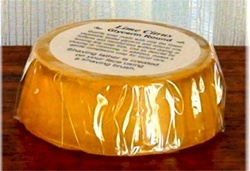 The soap dish is very nice and great quality. It looks good in the bathroom!